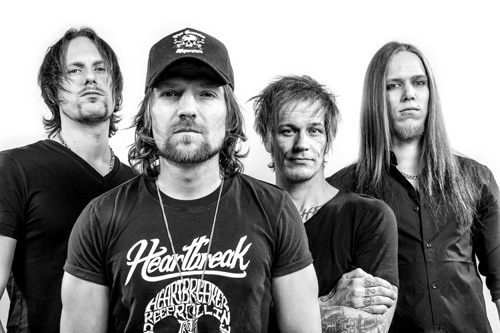 The New Roses may be the best American hard rock band you've never heard of. Why? Because they're not from the United States. The New Roses are from Germany. They arrive with their second long player One More For The Road on the Napalm Records label. Listening to The New Roses style of hard rock, the allusion to their American cousins is valid. You will easily hear some latent blues and obvious Southern rock, with nods to The Black Crowes, Guns N Roses, and Kid Rock. Kid Rock? Yeah, but without the whole hip hop rap baggage. Dissecting The New Roses sound a little more, you'll find their hard rock to be guitar centered with riffage that ranges from brisk and sharp to raw and razor-like. There's enough edge to the guitar lines to give many songs a metal edge. Yet they wrap these things are wrapped up in an abundance of twin guitar harmony and melody. And like true hard rock arrangements, the song's end game is always a striking guitar solo. The rhythm section is formidable as well, laying down a thick rock groove to power the songs along. Finally, for AOR accessibility, The New Roses give you plenty of hooks to catch your listening ear, whether by a strong groove, twist of a riff, or a catchy refrain. As for the album and songs, One More For The Road is a true long player. With ten songs and three bonus tracks, the recording clocks in at nearly an hour. It may be a bit much, overkill even, but TNR does it efficiently with most songs around three and a half minutes in length. Some of the best below the belt rockers come with Dancing On A Razor Blade, One More For The Road, and the first bonus track, Do I Look Scared To You. Heavier ballads arrive with Fight You Leaving Me, with a subtle symphonic score underneath, and The Storm, another bonus track. But the killer tracks are three. Life Ain't Easy (With A Boy With Long Hair) dips into that Kid Rock Southern Rock vibe. My Own Worst Enemy finds TNR stealing a page from the AC/DC playbook in the vocal arrangement. Finally, Consider Me Gone, my favorite track, grabs with its groove, catchy melody, memorable lyrics and refrain, and razor sharp guitar solo. 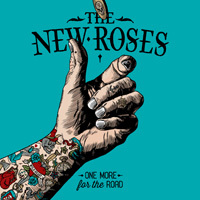 All considered, with One More For The Road, The New Roses deliver some mighty fine hard and heavy melodic rock. This band rocks. Easily recommended.